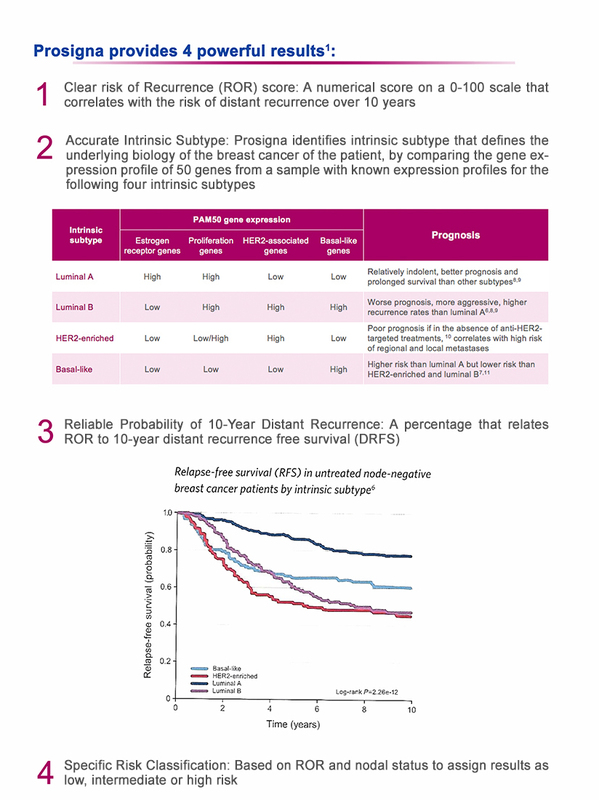 Prosigna is the only PAM50-based, early-stage breast cancer assay to deliver a highly accurate assessment of risk of distant recurrence with a personalized prognostic score that identifies your patient's 10-year risk. Which patients are appropriate for Prosigna? Postmenopausal women with hormone receptor-positive, node negative (stage I or Stage II), or node-positive (Stage II and IIIA) breast cancer to be treated with adjuvant endocrine therapy. 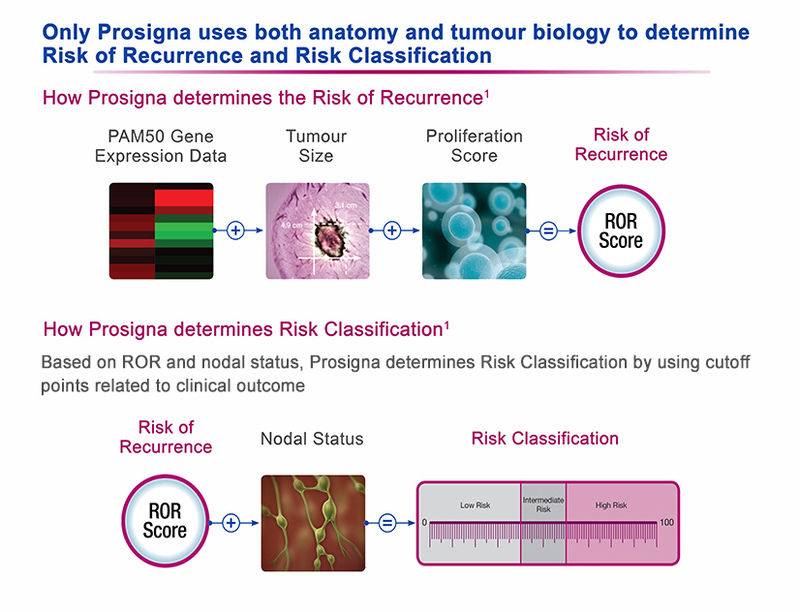 Prosigna provides a risk catergory and numerical score for assessment of the risk of distant recurrence of disease at 10 years, helping to inform clinical decisions with prognostic information beyond standard clinical variables (age, grade, tumour size, nodal status, and adjuvant therapy). Validated on 2,479 samples in the combined ABCSG-8 and TransATAC studies. The test is FDA 510(k) cleared and CE-marked. Recognized and listed in multiple international guidelines including ASCO, NCCN, and ESMO. Please contact us for further information and/or test ordering. Reference: 1. Prosigna [Package Insert]. Seattle, WA: NanoString Technologies, Inc., 2013. 2. Perou CM et al., Nature 2000; 406(6797); 747-752. 3. Sorlie T et al. Proc Nati Acad Sci USA, 2003; 100(14):8418-23. 4. Goldhirsch A et al. Ann Oncol, 2013;24:2206-2223. 5. Cancer Genome Atlas Network. Nature 2012;290(7418):61-70. 6. Creighton CJ. Biologics. 2012;6:289-297. 7. Parjer JS et al. J Clin Oncol. 2009;27(8): 1160-1167. 8. Dowsett M et al. J Clin Oncol.. 2013;31(22):2783-2790. 9. Gnant M et al. Ann Oncol. 2004;25(2):339-45. 10. Voduc KD et al. J Cllin Oncol. 2010;28(10):1684-91. 11. Haque R et al. Cancer Epidermiol Biomarkers Prev. 2012;21(10):1848-1855.